We love being at the heart of life in Filton and now we want to celebrate what’s best about living here. 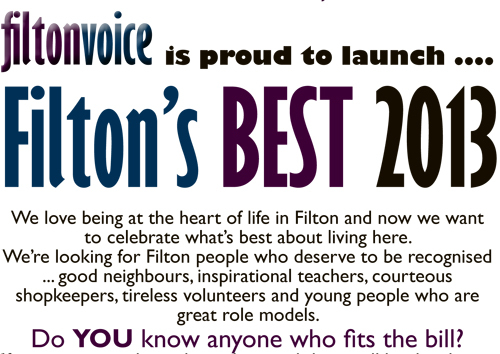 We’re looking for Filton people who deserve to be recognised ... good neighbours, inspirational teachers, courteous shopkeepers, tireless volunteers and young people who are great role models. If so, we want to hear about them and there will be the chance to recognise their achievements at a special ceremony in Filton in the Autumn. See below to find out what to do next. Does your neighbour go the extra mile, look out for everyone in the street and generally make life a whole lot better? Do you always get a smile and perfect service ... and do they go out of their way to help? We’re looking for a teacher who really inspires the children and makes school both fun and a great place to learn. Is there someone in Filton who does a lot of work without any financial reward, with the motivation purely to make the community better? Is there someone aged 5-18 who has achieved a lot, maybe against the odds, or who does a lot more than the average young person for their family or community?